The lads came to set a new 24hr karting team world record using hand controls. 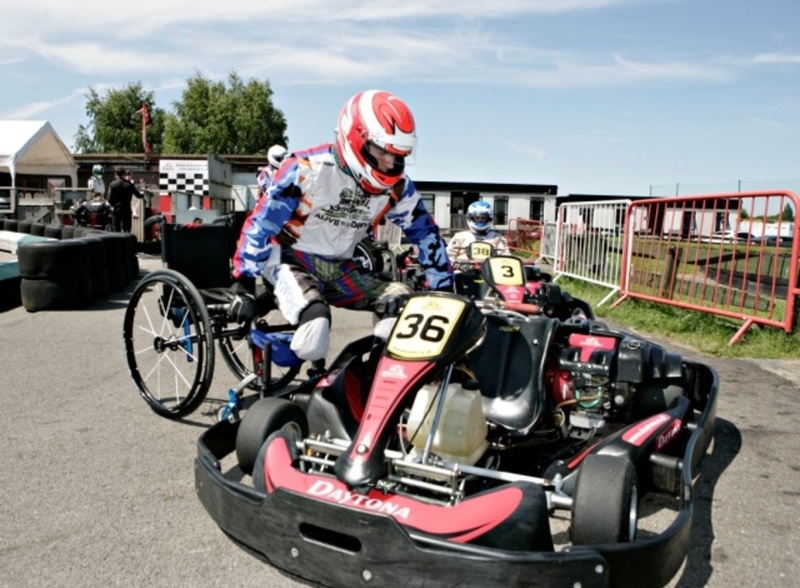 Two of the 4 lads had never driven a competition kart like this – the other 2 lads raced in it for the first time the week before. None of us had an idea how they’d manage over a 24hr period or what their lap times would be, so we couldn’t come up with any estimated distances or targets. All the lads could do was what they always do – just maximum effort and bucket-loads of determination. The start was postponed from 09.00hrs to 12.00hrs as it was raining. For the first few hours they put in their laps on “Wets” but as soon as the rain stopped we changed the tyres to “Slicks” and as the track dried out, their lap times got faster and faster. Not only were they getting faster, but all their lap times were consistently within 1 or 2 secs of each other, hour after hour. At the same time as the lads were setting their new record, Team Dino Kart Record were attempting to break the existing 24hr team record – 2,056.70 km set in 2007 at the same track. As the hours passed we started looking at the lad’s lap times, number of laps and distances achieved and started to compare their progress with the existing world record. By hour 12 – the half way point – the lads had clocked up 1,425 laps – only 25 less than the existing world record holders. That worked out to be only 12 ½ mins short of the target for the existing world record. We’d had around 3hrs of rain at the start… we lost a few minutes changing the Wets to Slicks… and we had changed to a new set of Slicks. Could the lads make up these 12 ½ mins in the remaining 12 hours? It was now dry and we didn’t need to change tyres again. Driver change-overs and re-fueling stops were going perfectly. The kart was running like a dream. From the half-way point at mid-night they methodically chipped away at the gap and the difference was getting shorter – this would hopefully improve in day light. But at 05.15hrs as it was becoming day-light, with almost 7hrs to go, it started to rain and didn’t stop until the end of the event. Wets had to go back on and lap times dropped, so it became impossible to break the existing world record. After 24 hours the lads clocked up an impressive 2,660 laps and set a new 24hr world record with hand controls of 1,888.6 km. This works out to be only 168.1 km (8.2%) short of the existing record set by a team of very experienced kart racers using a faster and more powerful geared kart, in dry conditions. Once again, these lads have shown that you don’t need all your limbs to compete on a totally level playing field against non-injured drivers. Between the 4 lads they had 3 legs – 2 lads had missing fingers/thumbs making it even demanding using hand controls. They came to set a new world record and had it not rained there was a real possibility that they could’ve beaten the existing record too. This really puts what these injured lads have achieved into perspective – a very impressive result beyond everyone’s expectations. This world record will be officially confirmed by Guinness World Records in the next 10 to 14 days. To see all the event photos and feedback from our supporters please check out our Facebook page. Feel free to leave a message too as the lads read them all.